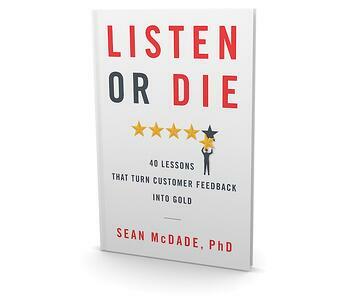 After months of brainstorms, meetings, late nights and deadlines, I am thrilled to announce that my first book, Listen or Die: 40 Lessons That Turn Customer Feedback Into Gold, will be available for purchase on Amazon starting Tuesday June 19th, 2018. Listen or Die is a culmination of my 20+ years of CX experience boiled down into 40 quick lessons. These easy-to-use best practices provide CX leaders with the tools needed to build exemplary Voice of Customer programs that deliver ROI, turning customer feedback into gold. "Many companies collect customer feedback, but very few act on what they hear. Listen or Die provides some great advice for closing the gap." Listen or Die is written primarily for CX professionals in enterprise companies who are in charge of listening to customers. It is also relevant for anyone who is interested in CX or wants to learn more about how customer feedback can be used to drive business results. Entrepreneurs looking for a crash course on how to best listen to customers and use that feedback to improve their business will benefit from the book as well. "Moving VoC past data to a listening path that engages your organization and improves customer experiences is key. In this book, Sean McDade provides a game plan for how to embed this inside your organization." — Jeanne Bliss, Best-selling Author of Would You Do That To Your Mother? This book will guide you no matter where you are in your VoC journey. If you plan to lead a new VoC program, you'll learn how to start it. If you've been collecting customer feedback for a year or so, you'll get strategies for ramping it up. If your VoC program is more mature, you'll find out how to make it ten times more effective. My goal is for you to find answers to at least some of your burning questions, including those you didn't know to ask. I can't wait to share this book with you! Listen or Die is now available for purchase on Amazon.